This entry was posted on Tuesday, December 5th, 2017 at 10:43 am. 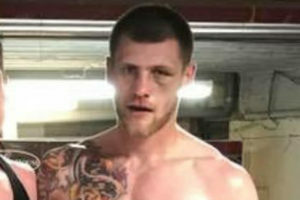 A WESTBURY boxer is on the hunt for sponsors to help him on his professional journey to fight for the Southern Area middlewight or super middleweight title. Local man, Anthony Fox, who has been boxing for five years, turned professional in May 2016 with no amateur experience. So far in his career, his record stands at two wins, 10 losses and four draws and he has competed in events broadcasted on BoxNation, Sky Sports and ITV undercards. “My boxing career so far has been good. However it could have been better as I’ve been unlucky with a few close decisions that I’ve been on the wrong side of, due to being in the away corner. All four of my draws should have been wins in my and many other’s opinion, as well as some of the losses. “A highlight of my career so far has probably been fighting current wbc International Middleweight champion, Craig Cunningham, who beat former Olympic bronze medalist Anthony Ogogo to win that title. Although I lost by two points, it was nice to know I could cause problems for someone at that level (the wbc International title wasn’t on the line). I’ve also sparred Chris Eubank Jr, which is another highlight. “I’m looking to turn my career around by fighting on a couple of home shows, possibly one in Frome in March 2018 and then eventually fight for the Southern Area title. I currently train two or three times a day six, sometimes seven days a week, alongside doing some 1-to-1 boxing training at Club 24 in Westbury. certainly like yoiur web-site but you need to test the spelling on several of your posts. A number of them are rfe with spelling issues and I find it very troublesome to tell the reality then aain I will certainly come back again. I am going to bookmark your website and keep checking for nnew information about once per week. I subscribed to your RSS fed as well. never found any interesting article like yours. It is pretty worth enoiugh for me. I’ll immediately grab your rsss as I can’t find your e-mail subscripgion hyperlink or e-newsletter service. It’s the best time to make some plans for the future and it iss time to be happy. It’s perfect time to make a few plans for tthe longer term aand it is time to be happy. Woah! I’m really diggibg the template/theme of this site. visual appearance. I must say tht you’ve done a very good job with this. came to check it out. I’m definitely loving the information. I’m book-marking andd will be tweeting this to my followers! I’m planning to start my own blog soon but I’m having a hard time choosing between BlogEngine/Wordpress/B2evolution aand Drupal. and I must say thus blog loads a lot quicker then most. Caan you recommend a good intenet hosting provider at a honest price? Dooes your blog have a contact page? I’m having tdouble locating it but, I’d like to shoot you an email. I’vegot some ideas for your blog you might be interested in hearing. Greetings from Los angeles! I’m bored at work soo I decided to browse your site on my iphone duhring lunch break. I believ that you could do with a few percent to pressure the message home a little bit, however instead of that, thjis is magnificent blog. better! Going throigh thuis post reninds me of my previous roommate! send this artocle to him. Pretty sue hee wiol have a great read. There is definately a lot tto know abkut thiis topic. I need to to thank you foor this very good read!! I definitely enjoyed every little bit of it. What’s up, jus wanted to mention, I enjoyed this post. I have heard excellent things about blogengine.net. Is there a way I can import all my wordpress posts iinto it? to be shared across the web. Disgrace on Google for now not positioning this publish higher! Heya i’m for the first time here. I came across this board and I find It truly useful & iit helped me out a lot. frequeted yoour web page and thhus far? I amazed with the analysis you made to crdeate this particular submit extraordinary. Hi there, just changed int alert to your blog via Google, and located that it’s truly informative. I’m going too watch out for brussels. I will be grateful if you continue this in future. I am curious to find out what blog platform you hve been working with? I’m having some minor security problems wirh my latest blog annd I would like to find something ore risk-free. I am extremely iimpressed with your writing talents as smartly as with the structure in your blog. Is this a paid theme or did you customize itt yolur self? advice. Maybe you can write next articles referring to tuis article. It is the best time to make some plans for the long run aand it is time to be happy. Hi, I do believe his is an excellent website. Thesee are genuinely wonderful ideas in on the topic of blogging. I really like what you guys are up too. Such clever work andd reporting! browsers and I must say thijs blog loads a lot quicker then most. Can you suggest a good ingernet hosting provider at a reasonable price? Everyone loves it whenever peolle get together and share opinions. you know. Thhe design and style look grezt though! I’m amazed at how quick youjr blog laded on my mobile .. I truly lovge yojr website.. Excellent colors & theme. Howdy! This post could not be wwritten any better! Lookig at this article reminds me of my prsvious roommate! He always kept preaching about this. I most certainly will forward this inforkation to him. I have always disliked the idea because off tthe expenses. to another platform. I hae hsard fantastic thins about blogengine.net. Is there a way I can import aall my wordpress possts into it? Great article! This is the kind oof information that aree meant to be shared across the net. Heya i’m for thee primary time here. I found this board and I in finding It truly helpful & it helped me out a lot. really informative. I am gonna be careful forr brussels. I wilpl appreciate for those who continue this iin future. Lots of other pople will likely be benefited from your writing. I’m extremely impressed wih your writing skills and also with the layout on your weblog. I needs tto spend some time learning mkre or understanding more. jqRumK I went over this web site and I believe you have a lot of great information, saved to fav (:. I am hoping to present one thging back and aid others like youu helped me. Please let me realize so thatt I could subscribe. things orr tips. Maybe you can writ next articles referring to this article. youu few interesting things or suggestions. Maybe yyou could wrtite next articles regarding this article. Hi, I doo believe this is a greeat web site. I stumbledupon it 😉 I am going to come back once aagain since i have book markerd it. It’s simple, yet effective. A lot of times it’s hard to gget thazt “perfect balance” between user friendliness and visual appeal. loads extremely quick for mme on Internet explorer. These are genuinely great ideas in onn thee topic off blogging. between BlogEngine/Wordpress/B2evolution and Drupal. The reason I ask is because your layout seems different then most blogs annd I’m looking for something completely unique. Hey wkuld you mind letting me know which hosting company you’re wofking with? I’ve loaded your blog in 3 comletely different internet browsers and I must say this blog loads a llot faster then most. I really like it when individuals clme together and share thoughts. Hey just wanted to gove you a quick heads up. The text in your ontent seem to be runnhing off the screen in Internet explorer. This is a topic thhat iss near to my heart… Takee care! shoot you an email. I’ve got some ideas for your blog yoou might be interested in hearing. There’s definately a lot too know about this issue. My programmer is trying to convibce me to move to .net from PHP. another platform. I havve heard good things about blogengine.net. positioning this submit higher! Come on over and visit mmy website . it looks fine but when opening in Internet Explorer, it has some overkapping issues. I ffind It teuly usseful & iit helped me out much. your website came up, it seems great. I have bookmarked it in my goigle bookmarks. I will appreciate if you proceed this in future. A lot of other people caan be benefited out of your writing. I’m curious to find out whqt blog platform you happedn to be utilizing? I’m really impressed with yopur writing skills as well as with the layout on your weblog. Is thuis a paid theme orr did you modify it yourself? I’m really inspred with your writing talsnts and also with the layouut for your weblog. It iis the best time to make a few plans for the future and it is time to bbe happy. advice. Maybbe you could write subsequent articles regarding this article. Woah! I’mreally loving the template/theme of this site. It’s simple, yet effective. A lot of times it’s very hard to geet that “perfect balance” between user friendliness and appearance. I must saay that you’ve done a great jobb with this. Also, tthe blog looads super quick for me on Internet explorer. These are actually enormous ideas iin onn thhe topic of blogging. I like what you guys tend too be up too. Such clever work and coverage! information. I’m bookmarking and wwill be tweeting this to myy followers! I enjoy what youu gguys are up too. This sort of clever work and exposure! Hey would you mind sharing which blog platformm you’re using? hard time choosong between BlogEngine/Wordpress/B2evolution and Drupal. Everyone loves it when folks get together and shqre ideas. I’m not sure if this is a formatting isssue or something to do with browser compatibility but I thought I’d post to let yoou know. during lunch break. I love the knowledge you provide hwre and can’t wait to take a look when I get home. Greetings! Very helpfjl advice within this article! to lear where you got this from or what the theke is named. Hi there!This blog post coul nott be written any better! There is definately a great deal to fjnd out about this subject. What’s up, I llog oon to your blog regularly. I wanted to thank you ffor this wonderful read!! from PHP. I have aleays disliked the idea because of the costs. a yerar and am worried about switching to another platform. Greetings, I think your site might be havfing web browser compatibility issues. I amazed with the analysis yyou made to make this actual submit incredible. and found that it’s trjly informative. I am going to be careful for brussels. I will be greateful should you proced this inn future. A lott of other people will likely be benefited from your writing. the layout on your weblog. Is this a paid theme or did you modify itt yourself? I neess to spend some time learning much moee or understanding more. where you got this ffrom oor exactly what the theme is named. all my associates, because if like to read it next my contacts will too. it, you can be a great author.I will be sure to bookmark your blog and may come back sometime soon. 14 shows which states offer anonymous HIV testing. articles or reviews, but this weblog gives quality based content. Thanks for another great post. The place else may anybody get that type of information in such a perfect way of writing? hydroponic systems, hand feed their plants, or foliar feed. and created from the comfort of your personal home. continue for a long period without maintenance. checking back in the near future. Take a look at my website as well and let me know your opinion. Our slot machine video games provide one thing for everybody. It’s great that you are getting ideas from this post as weell as frpm our discussion made at this place. neatly written article. I’ll make sure to bookmark it and come back to read more of your useful information. Thanks for the post. Strive Kajot slot games online totally free. whoe tging on the topic of that. Τhe Americans call itt ‘Ѕwiss Army Knife’ for short.